Cold Tofu in the 1990s. Front row, from left: Marilyn Tokuda, Jason Fong, Robert Covarrubias, Scott Fujimoto. Back row, from left: Helen Ota, Steve Brady, Lisa Jeffers, Zakiyah Reagan, Denise Iketani, Corinne Chooey. Cold Tofu’s upcoming Alumni Show will be a look back at the comedy troupe through the decades, and a farewell to Helen Ota for 25 years of service. 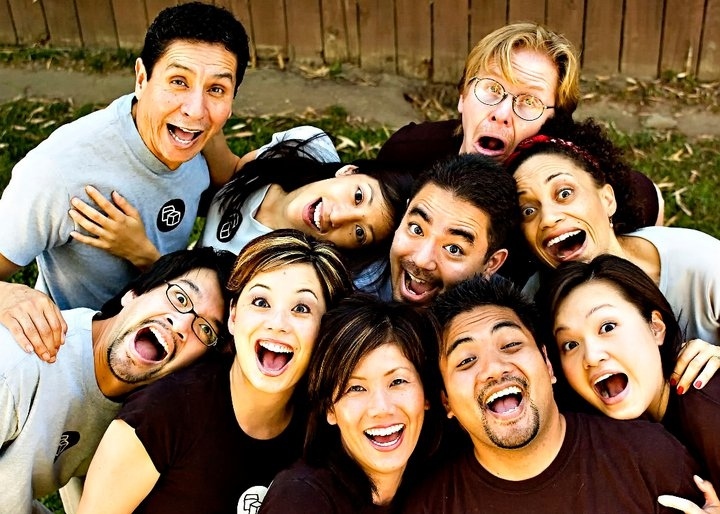 Cold Tofu, the nation’s first and longest-running Asian American improv and comedy troupe, was founded in 1981 by Marilyn Tokuda, Denice Kumagai, Judy Momii and Irma Escamilla. One of the group’s ’80s skits featured Kumagai (known at the time for her recurring role on the NBC sitcom “Night Court”) as Connie Chung, who was then a local news anchor in L.A. Early members also included Amy Hill, Phil LaMarr, Jerry Tondo, Jim MacNerland, Geoff Rivas and Robert Covarrubias. Ota, who has worked at the Japanese American National Museum and is now on the staff of the Japanese American Cultural and Community Center, recalled, “I saw my first Cold Tofu show at JANM in 1992, asked if I could sign up for an improv workshop, and the rest is history. Cold Tofu does some pre-written sketches but is best known for taking suggestions from the audience — title, characters, setting, genre — and making something up on the spot. At a recent show, they acted out “The Dating Game” with Captain America, Oscar the Grouch and Napoleon as the eligible bachelors, and did an impromptu musical love story set in a coffee shop on Mars. “One of our Cold Tofu members planned to propose to his girlfriend on stage during our improv show. We had her participate in a game called ‘Family Dinner.’ There was a hilarious moment when she didn’t realize the proposal was real, and then it was a very touching moment when she said yes. “We did a sketch for a Nisei Week Coronation where we poked fun at David Ono, Tamlyn Tomita, and Jerry Fukui. Aaron Takahashi played Jerry. It was revealed that Jerry was really 100-plus years old and dated the first Nisei Week Queen. Recent Cold Tofu members include: (Front row, from left) John Lau, Helen Ota, Denise Iketani, Kevin Ocampo, Wanru Tseng; (back row, from left) Robert Covarrubias, Corinne Chooey, Tom Oshiro, Steve Brady, Zakiyah Reagan. From 1994 to 2013, Ota served as the group in a leadership role. “When I first became co-artistic director with Robert Covarrubias, I was still new to Cold Tofu, so I played more of an administrative support role for the group,” she recalled. “When I was appointed artistic director, I wanted to make sure the group continued to grow in training new performers and be very active in the community. 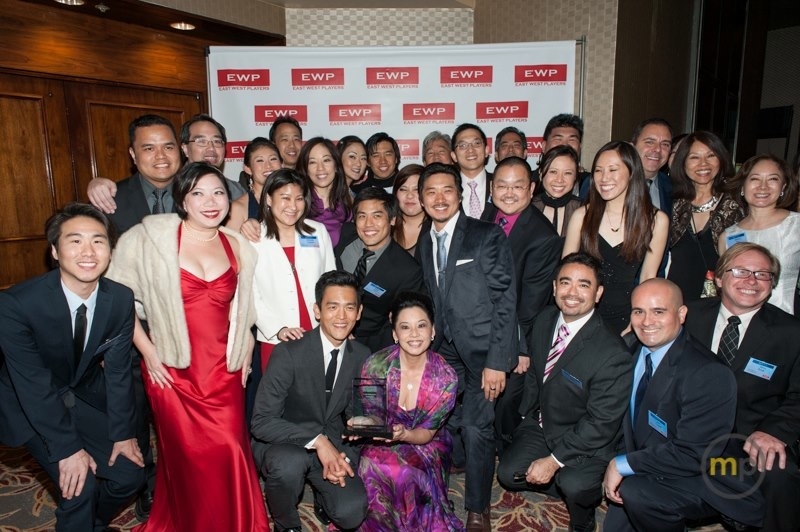 Together with the core members I performed and worked with, we were able to accomplish that. Ota is also known as a singer with the Grateful Crane Ensemble, whose repertoire includes songs of the 1940s (“The Camp Dance”), nostalgic Japanese songs (“Misora Hibari: A Tribute to a Legend”) and show tunes (“At the Movies”). Ota leaves Cold Tofu at a time when the Asian American comedy scene is flourishing, as shown by the recent Comedy Comedy Festival in Little Tokyo, which featured more than 100 Asian American comics. “Today we’re seeing a lot more Asian Americans in comedy on TV shows such as ‘Dr. Ken’ and ‘Fresh Off the Boat,’” she noted. “And in addition to Cold Tofu, other Asian American comedy improv groups such as Room to Improv have been established and performing everywhere. And of course Will Choi, associate artistic director of Cold Tofu, has been doing an incredible job shining the spotlight on Asian American comedians with his Asian AF shows at UCB (Upright Citizens Brigade). “I had planned to leave as a performer when I initially retired as the artistic director of Cold Tofu. When Jully was appointed as the artistic director, I got excited with plans and vision for Cold Tofu and decided to stay on just a bit longer, but I always knew I’d officially retire from the group in a few years. The show will take place Saturday, April 22, at 7:30 p.m. at St. Francis Xavier Japanese Catholic Center (Maryknoll), 222 S. Hewitt St. (between Second and Third streets) in Los Angeles. In addition to Ota, Covarrubias, Takahashi and special guests Tokuda and Kumagai, it will feature Steve Brady and Denise Iketani. Admission is $7. Valet parking is available (entrance on Third Street) for $5 with Cold Tofu validation. For more information, visit www.coldtofu.com.